Here you’ll find travel reports about Mahia Beach. 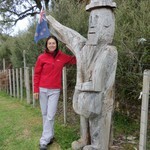 Discover travel destinations in New Zealand of travelers writing a travel blog on FindPenguins. Arriving at a holiday park campsite which was pretty much empty we setup our tent and went out to walk a little the beachfront as well as lateron up the coastal cliff mountain to watch the properly most beautiful sunset in our time here in NZ. Na ostrov, ktery se lety naplavovanym piskem spojil s pevninou a zmenil v poloostrov, se jezdi za surfovanim, rybarenim, potapenim... My jsme se sem jely - klasicky - trochu projit. Nejdriv pozustatkem pobrezni buse, pak na Te Kapu (397 m), nejvyssi kopecek siroko daleko. Angekommen in Mahia haben wir uns mit unserem Gaskocher Abendessen gekocht und danach nur noch entspannt den Abend ausklingen lassen 😊 morgen geht es weiter!